Stainless steel is a material that is known the world over and has a hugely diverse range of uses in everyday life; From the unforgettable accents of the Chrysler Building in New York to the essential components of an MRI scanner and more commonly, the humble spoon or coat zipper. But how has it become so prevalent in such a diverse range of applications? And how can you choose the right type of stainless steel for your project? Read on to find out more. Just like steel, stainless steel is an alloy which means that it consists of different materials. When steel has a chromium content of more than 10.5% it is considered to be ‘stainless’. When this chromium is combined with oxygen it forms a thin, sealed, fixed-adhering, chromic-oxide layer – the so-called passive layer. It is this passive layer that gives stainless steel its distinctive corrosion resistance. While not truly stainless, even the most basic stainless steel alloys have an ability to withstand the elements and maintain their shine. The variety of alloying elements that make up different grades of stainless steels is what allows it to have a range of properties and subsequently be so versatile with many applications. What properties is stainless steel known for? Probably the main reason that stainless steel has become indispensable is its unique and beneficial range of properties. Not only does stainless steel have incredible strength but it is also highly resistant to corrosion, needs relatively little maintenance, has a long-life cycle and in most cases is also 100% recyclable. Ferritic: Ferritic steels are frequently used in kitchenware, industrial equipment and automotive applications. This is due to its high chromium level and low carbon content which gives it good ductility as well as resistance to corrosion and stress corrosion cracking. Austenitic: Austenitic steels are the most widely used grade of stainless steel and contain high levels of chromium and nickel, but low levels of carbon. They have very good formability and resistance to corrosion. Martensitic: Martensitic stainless steels are similar in structure to ferritic stainless steels but, due to added carbon, they can be hardened and strengthened by heat treatment which gives them improved toughness, weldability and corrosion resistance. Duplex: Duplex stainless steels are the most recent addition to the stainless steel family and were developed in the 1960’s. They are called ‘duplex’ as they have approximately equal proportions of ferritic and austenitic phases. This chemical composition gives it better strength, weight saving, greater corrosion resistance and a better price stability. Precipitation Hardening (PH); PH stainless steel is created through the addition of copper, molybdenum, aluminium and/or titanium. It can therefore be heat-treated which generates incredible tensile and yield strengths – much more than other grades of stainless steel. They are regularly used in the oil and gas, nuclear and aerospace industries where a combination of high strength, corrosion resistance and a generally low but acceptable degree of toughness is required. What industries are stainless steel used in? There are over 150 grades of stainless steel and it can be made into various different forms, including plates, coils, bars, sheets and tubing for use in industrial and domestic settings. How is stainless steel specifically used in the Energy and Heavy Industries? Although there are various other metals that are used in the Energy and Heavy Industries, steel is the most common and popular. It is fair to say that whenever any energy product has to be transported, steel in some form is used. Because the chemical, oil and gas industries operate in demanding environments involving high heat and highly toxic substances, special grades of stainless steel have been developed for use in these industries which feature enhanced resistance to corrosion over a wider range of temperatures. Stainless steel can be found in piping systems, separators, scrubbers, pumps, manifolds, heat exchangers, flowlines, and storage tanks. Super duplex steel is often used due to its high strength and the fact that it can be produced in large sheets which minimises the need for welding, helps to preserve its structural integrity and reduces the need for extra structural support, therefore potentially cutting construction costs as well. Stainless steel also forms an essential component of most off-shore oil rigs and marine environments. Crude oil’s corrosive nature means that stainless steel is a perfect material to contain it, similarly so in sub-sea conditions such as deep-sea drilling where the equipment being used has to be highly durable and resistant to corrosion. Likewise, renewable energy technologies including solar, geothermal, hydro and wind power also use stainless steel components as it is able to withstand the rigours of highly corrosive seawater environments. Properly selected, stainless steel permits safe containment of oil and gas process fluids and its durability ensures long life. Overall, stainless steel is an exceptional life cycle performer in both the environmental and economic senses. How can you choose the right stainless steel for your project? What is the corrosive environment of the project? What is the temperature of the operation? For example, High temperatures will accelerate corrosion rates and therefore indicate a higher grade of stainless steel whereas low temperatures will require a tough austenitic steel. What strength is required from the material? What welding will be carried out? Austenitic steels are generally more weldable than the other types. Ferritic steels are weldable in thin sections. Duplex steels require more care than austenitic steels but are now regarded as fully weldable. Martensitic and PH grades are less weldable. What product form is required? – Not all grades are available in all product forms, so you need to choose the right grade for the product you need. What is the required life-cycle of the stainless steel? Whether you need a new set of hard-wearing cutlery or a full suite of new pipes and flanges for your upcoming sub-sea drilling project, chances are that there will be a type of stainless steel for you. 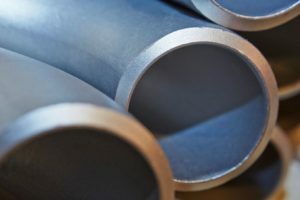 If it is the heavy industry material that you are after, then make sure you get in touch with Special Piping Materials today and we’ll help to source the grade of stainless steel and the product that’s right for you. . . if it’s a spoon you need then maybe head down to your nearest kitchen showroom!